The English guitar was in vogue from about 1750 until 1790. It was particularly popular among fashionable ladies who often preferred the version, like this one, that was fitted with piano-keys so as to preserve their nails from wire strings. Examples like this one were also tuned with a watch-key, most often in C major. 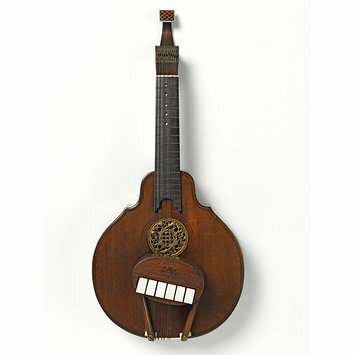 The modern Portuguese guitar is descended from this type of instrument. This English guitar was made by Friederich Hintz (d. 1772), a German immigrant cabinetmaker, who specialised in making metal-inlaid furniture as well as musical instruments. Guitar; sycamore back, pine belly, pointed shoulders, rose of stamped copper gilt with a musical instrument & diaper pattern in centre. Ebony fingerboard with fifteen brass frets, square finial on neck with chequerboard pattern in ebony & ivory, detachable mechanism on body for striking strings with felted hammers, box with Royal Arms of England. 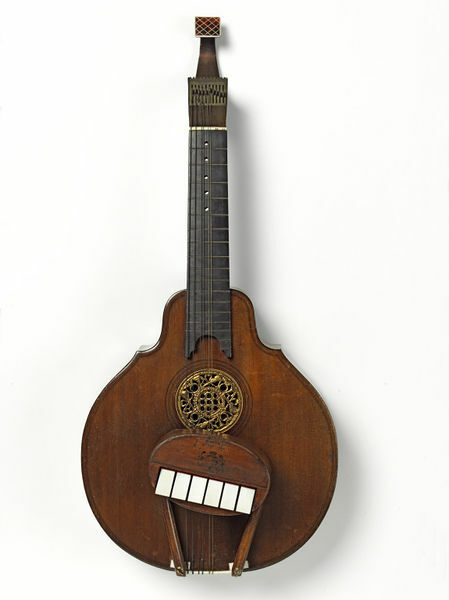 Guitar; by Frederick Hintz; London, Britain; 1755-60.